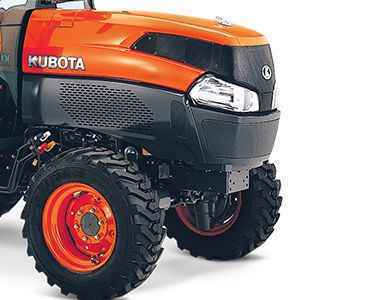 Kubota’s top of the line, mid-sized tractor, the L5740HDCA is powered by a reliable 4 cylinder, 57HP diesel engine and Kubota’s exclusive HST Plus transmission. Boasting premium features to deliver professional results for any task small or large, the L5740HDCA features Kubota’s Intelli-Panel tractor monitoring system, deluxe seating and independent PTO. 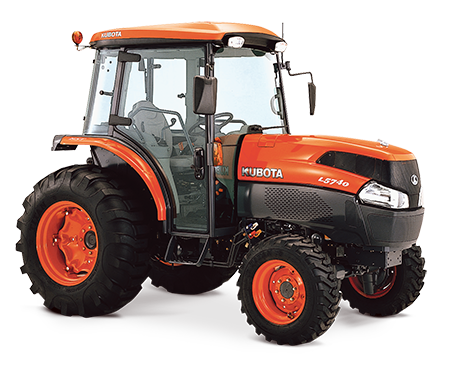 Extremely comfortable and packed with user-friendly and efficient features, the L5740HDCA tractor features Kubota’s Grand Cab, with air conditioning, spacious floor area, deluxe seating and dual-level climate control. Offering unmatched performance, versatility and durability, the Kubota L5740HDCA will see you take on any landscape with ease. HST Plus automated control of both the HST pump and drive motor gives you optimal performance, regardless of the task, working conditions, or operator expertise. Featuring three speed ranges, the L5740 includes a steering column lever to shift between high and low speeds for each range, expanding your options to six total speeds. Once your preferred range shift speed is set, you can easily shift the H-DS between the high and low speeds while moving. With a simple touch of the mode selection button, you can activate the auto H-DS for automatic Hi/Lo shifting. This feature is especially handy when moving between locations depress the HST pedal. or when towing a trailer. The HST response speed can be adjusted with a simple turn of a dial. If your task requires a quick response, you can turn the dial to the FAST setting. This setting is ideal for use during loader-related jobs. If the job at hand needs a more gradual response, as used for turf work, set the dial to SLOW. When your preferred response speed has been selected, you won’t need to make any more adjustments with the foot pedal. It’s that easy. Responsive hydrostatic power steering makes every job easier. Straight-a-ways and tight turns are taken smoothly, while steering remains easy and worry free when a heavy load is applied or the front loader is used.